Today, we got up early to drop our fearless leader and professor off at the airport. We immediately left the airport to make our way to the beach beside the University of the Virgin Islands ("UVI") MacLean Marine Science Center docks. We are grateful that the local United States Virgin Islands laws require that the public be given access to all beaches on the islands. After visiting UVI multiple times this past week as a transit point, it was great to be able to go to the beautiful beach there and do some snorkeling close to the shore. Formal lectures and field activities having finished, we lounged around the beach as we waited for the sun to rise over the palm trees to illuminate the water for clear-visibility snorkeling. While on the beach, we watched a Brown Booby (Sula leucogaster) dive repeatedly from the air into the water to catch fish. Also, we saw a Puerto Rican Anole (Anolis pulchellus), a lizard that falls into the grass/bush morphotype. Two other anole lizards, the Puerto Rican Crested Anole (Anolis cristatellus), a trunk/ground morphotype, and the Barred Anole (Anolis stratulus), a crown/trunk morphotype, are native to the Virgin Islands, and we saw these as well. Part of our reading assignments were about the anole lizards of the Virgin Islands, and we used these organisms in legal hypos throughout the week of the fieldtrip. We tried to catch these lizards all week to examine them up close, but without success. 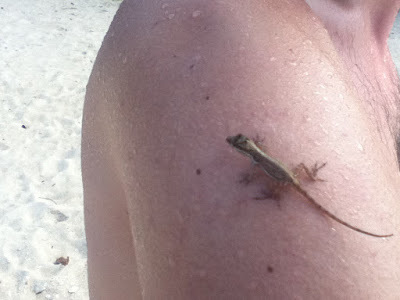 Finally, the Anolis pulchellus that we found near the beach’s tree line took pity on us, and decided to jump on an arm. Once the sun was shining over the bay, we went snorkeling. We saw schools of Ballyhoo (Hemiramphus brasiliensis) fish almost immediately. The bay, which is called Brewer's Bay, itself was largely sandy-bottomed, and had almost no coral. However, plenty of small fish were nibbling at the few pieces of coral that are present. One fish appeared to be territorial, aggressively protecting its part of the coral from all other fish who swam too close. As we swan out towards the moored boats, we saw some Green Sea Turtles (Chelonia mydas), a turtle federally-listed as endangered under the federal Endangered Species Act, enjoying morning swims. One particular turtle alarmed us by lunging towards us. It became very clear that Green Sea Turtles are much more agile in the water then we were. Luckily, the turtle decided we represented no threat, and subsequently left us alone. Surprising, we also saw a Southern Stingray (Dasyatis americana), our first of the fieldtrip. We found it amazing how each snorkeling trip this week revealed new species. It is precisely this richness and variety of biodiversity, along with the many legal issues that confront and surround it, that makes the Virgin Islands such an ideal place to study biodiversity law. Unfortunately, all good things must come to an end. Our trip has officially ended, but we will carry with us all the knowledge we gathered in our unique ‘classroom’ this week. That brings to an end the daily dispatches from the 2011 Biodiversity Law class. See you again this time next year for the 2012 class of Biodiversity Law.